Tiginor 10 : Each tablet contains Atorvastatin Calcium Trihydrate INN equivalent to Atorvastatin 10 mg.
Tiginor 20: Each tablet contains Atorvastatin Calcium Trihydrate INN equivalent to Atorvastatin 20 mg.
Tiginor 40: Each tablet contains Atorvastatin Calcium Trihydrate INN equivalent to Atorvastatin 40 mg.
Tiginor (atorvastatin) is a synthetic lipid-lowering agent. Atorvastatin is an inhibitor of 3-hydroxy-3-methyl-glutaryl-coenzyme A (HMG-CoA) reductase. This enzyme catalyzes the conversion of HMG-CoA to mevalonate, an early and rate-limiting step in cholesterol biosynthesis. 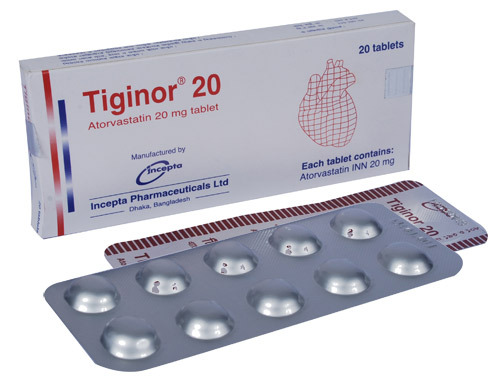 Tiginor is indicated as an adjunct to diet to reduce elevated total-C, LDL-C, apo B, and triglycerides (TG) levels and to increase HDL-C in patients with primary hypercholesterolemia (heterozygous familial and nonfamilial) and mixed dyslipidemia; as an adjunct to diet for the treatment of patients with elevated serum triglycerides (TG) levels; for the treatment of patients with primary dysbetalipoproteinemia who do not respond adequately to diet; to reduce total-C and LDL-C in patients with homozygous familial hypercholesterolemia as an adjunct to other lipid-lowering treatments (e.g. LDL apheresis) or if such treatments are unavailable. Prior to initiating therapy with atorvastatin, secondary cause for hypercholesterolemia (e.g. poorly controlled diabetes mellitus, hypothyroidism, nephritic syndrome, dysproteinemia, obstructive liver disease, other drug therapy, and alcoholism) should be identified and treated. The patient should be placed on a standard cholesterol-lowering diet before receiving Tiginor and should continue on this diet during treatment with Tiginor. 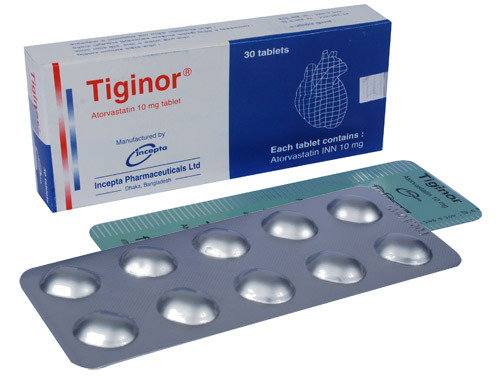 Hypercholesterolemia (Heterozygous Familial and Nonfamilial) and Mixed Dyslipidemia: The recommended starting dose of Tiginor is 10 mg once daily. The dosage range is 10 to 80 mg once daily. Tiginor can be administered as a single dose at any time of the day, with or without food. Therapy should be individualized according to goal of therapy and response. After initiation and/or upon titration of Tiginor, lipid levels should be analyzed within 2 to 4 weeks and dosage adjusted accordingly. Since the goal of treatment is to lower LDL-C, the LDL-C levels should be used to initiate and assess treatment response. Only if LDL-C levels are not available, should total-C be used to monitor therapy. Homozygous Familial Hypercholesterolemia: The dosage of Tiginor in patients with homozygous FH is 10 to 80 mg daily. Tiginor should be used as an adjunct to other lipid-lowering treatments (eg, LDL apheresis) in these patients or if such treatments are unavailable. 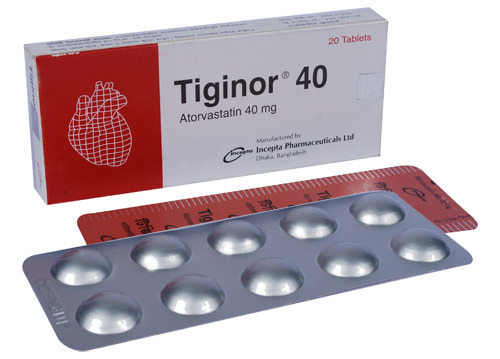 Concomitant Therapy: Tiginor (Atorvastatin) may be used in combination with a bile acid binding resin for additive effect. The combination of HMG-CoA reductase inhibitors and fibrates should generally be avoided. Dosage in Patients With Renal Insufficiency: Renal disease does not affect the plasma concentrations nor LDL-C reduction of atorvastatin; thus, dosage adjustment in patients with renal dysfunction is not necessary. Pediatric Use: Treatment experience in a pediatric population is limited to doses of Tiginor up to 80 mg/day for 1 year in 8 patients with homozygous FH. No clinical or biochemical abnormalities were reported in these patients. None of these patients was below 9 years of age. Geriatric Use: Treatment experience in adults age 70 years with doses of Tiginor up to 80 mg/day has been evaluated in 221 patients. The safety and efficacy of Tiginor in this population were similar to those of patients <70 years of age. Atorvastatin is generally well tolerated. Adverse reactions have usually been mild and transient. In controlled clinical studies of 2502 patients, <2% of patients were discontinued due to adverse experiences attributable to atorvastatin. The most frequent adverse events thought to be related to atorvastatin were constipation, flatulence, dyspepsia, and abdominal pain. Before instituting therapy with atorvastatin, an attempt should be made to control hypercholesterolemia with appropriate diet, exercise, and weight reduction in obese patients, and to treat other underlying medical problems. Information for Patients: Patients should be advised to report promptly unexplained muscle pain, tenderness, or weakness, particularly if accompanied by malaise or fever. Since HMG-Co A reductase inhibitors decrease cholesterol synthesis and possibly the synthesis of other biologically active substances derived from cholesterol, they may cause fetal harm when administered to pregnant women. Therefore, HMG-Co A reductase inhibitors are contraindicated during pregnancy and in nursing mothers. Atorvastatin should be administered to women of childbearing age only when such patients are highly unlikely to conceive and have been informed of the potential hazards. If the patient becomes pregnant while taking this drug, therapy should be discontinued and the patient apprised of the potential hazard to the fetus. Because of the potential for adverse reactions in nursing infants, women taking atorvastatin should not breast-feed.